Home / Event / Cinco de Drifto: DRIFT TANDEM MAYHEM! Cinco de Drifto: DRIFT TANDEM MAYHEM! 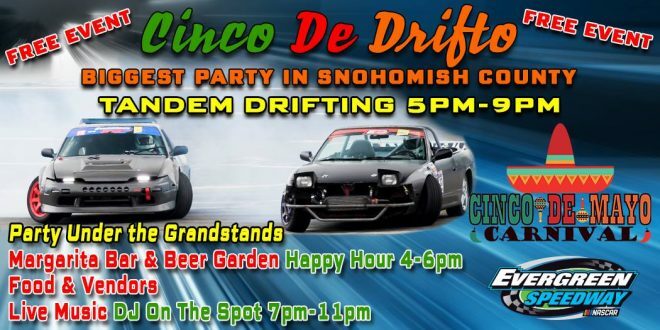 Join us May 5th for Cinco de Drifto DRIFT TANDEM MAYHEM! Follow our Facebook Event Page for latest news! $20 admission/FREE 10 and under. ​Support the Evergreen Fair Foundation and the Monroe Chamber of Commerce by shopping at their vendor markets! The Monroe Chamber Market will be under the Grandstands Friday 4-10pm, Saturday 2-10pm and Sunday 10am-4pm. The Evergreen Fair Foundation’s Homespun Bazaar will be in the Commercial Building Saturday 10am-4pm and Sunday 10am-3pm. Various food options will be available all three days including Carnival Food, Fisher Scones, Pioneer Popcorn, Taco Monte Alban, Dippin’ Dots, Elephant Ears, Churros, Speedway Concessions and the Margarita and Beer Garden (Happy Hour Friday 4-6pm and Saturday 3-5pm in the Garden). Live DJ and Cinco de Mayo Party Friday Night (Grandstands), Farmer for a Day, Western Heritage Museum, Swap Meet, WAC Gun & Knife Show, and Spring 4H Horse Show! Check the schedule above for event information. Previous Drift What You Drive Open Drift April 30th! Next Drift What You Drive OPEN DRIFT May 14th!